I had a not so refreshing night’s sleep. By the time I turned out the light last night (1:30), the ship had begun to roll a bit. It was quite relaxing; & I did fall right asleep. But the closer we got to Boston, the ship settled down a little too much. I kept waking up. I got up to look out the window about 7:45; the sun was shining brightly; & we were backing our way into our berth. The Costa Atlantica was coming in behind us. And the Jewel of the Seas was already here, berthed off our bow. I guess it was to be a busy day in Boston. I went to work on the blog for a while. 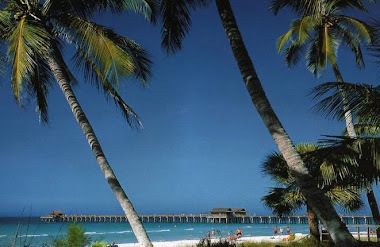 I was beginning to crave my morning capp’o; & wondering exactly what time Michael might be arriving at the pier. So, I called; & he was still at home in (Pawtucket, RI) trying to figure out what to wear! Is this for real? I had told him that casual night on Crystal meant nice looking slacks (no jeans) & a shirt. This obviously was a challenge for Michael, since his life revolves around either a uniform or jeans. He promised he’d call when he came into the city. I dressed; & headed down to the Bistro with the laptop; ready for my coffee. I had some fruit, fresh squeezed orange juice & the coffee. About an hour or so later, I called Michael again; he was just now getting off the interstate. I reminded him that the ship was only going to be in Boston about 36 hrs; & the he’d better hurry up or we’d be gone. Finally, about 10:45 he called saying that he had just parked the car & was trying to figure out which ship was mine. I told him I’d run down to the gangway & watch out for him. I didn’t have a coat; & it was quite cold out there (mid 40’s). I called again & told him to look for the yellow buses; I turned & come see him coming down the pier. He said he didn’t know if he should go ahead & bring his clothes in now or later. I asked why would he want to get back off the ship later? Go get them now. I headed back into this cavernous warehouse building, which was “our terminal” to try to get out of the wind. I saw a good number of crew rushing off to do some much needed shopping. Including the Chief, who was off to do some early holiday shopping for his family. I almost didn’t recognize him in regular clothes. He looks a lot different; but still so fine. Michael must have parked the car somewhere in RI; cause it took him 30 mins. to come back. Finally, onboard at 12:30, we headed right away to lunch in the Lido. I had a bowl of soup, a half BLT sandwich (which had a slice of brie on it, very good combo), a small piece of filet mignon, some hearts of palm & some camembert cheese w/ apricots. We talked for a while (lamenting over our new Droid phones & how difficult it is for us “oldsters” to figure out how to use them). As a belated b’day present, I had booked a massage for Michael at 2 pm. In all his years, he had never had a massage; & he was kinda nervous. I coached him on how to “direct” the masseuse. He finally joked, “if I can jump out of an airplane (skydiving on his 50th b’day), then I guess I can handle this”. I walked him up to the spa & told the girls to return him “a new man”. When he finally returned to the cabin; he was looking pretty “mellow”. We went down to the Bistro for capp’o. Peggy (xrvlcruiser) came by to chat. She had been on 2 tours today; & hadn’t had time for lunch. People were beginning to emerge in their evening attire. I decided now was a good time to give him a grand tour. He’s been on many ships in his life; but he’s never experienced Crystal. We had 7pm reservations in Silk Road. Another first for Michael…..eating with chopsticks. After a short lesson, he made it through the tempura & sushi using them; but finally gave up on the entrée. We asked the waiter to prepare a platter of various kinds of each; everything was delicious. We had a hard time deciding on the entrees; trying to order some of everything that we wanted a taste of. 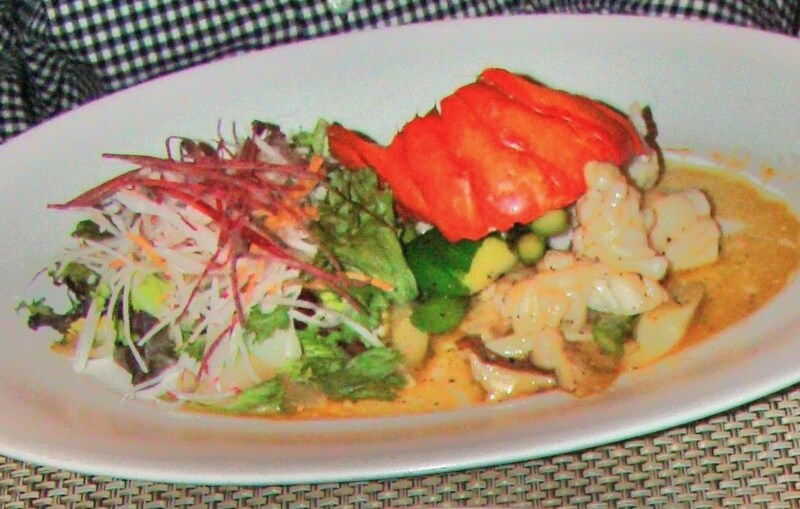 I knew one of us had to order the Nobu-Style Lobster with Truffle-Yuzu sauce. And I couldn’t resist a selection of my favorite appetizers. 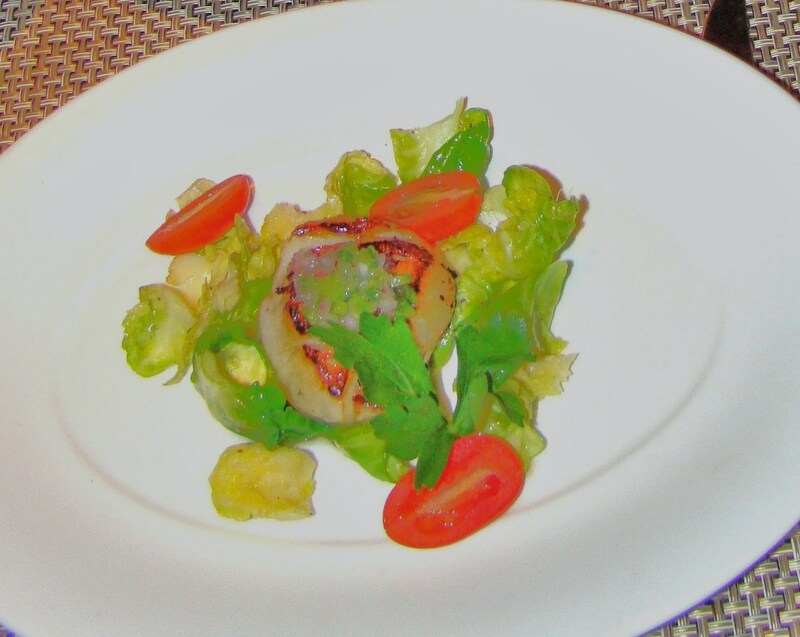 So, I chose the pan seared diver scallop, which is plated beautifully on a bed of stir fried baby brussels sprouts leaves drizzled with a not too spicy jalapeno relish. I also chose the broiled eggplant that’s been marinated in the most awesome miso sauce; creates an almost crispy coating. The last appetizer was the rock shrimp; which is tempura fried, served on a bed of shredded lettuce & drizzled with a spicy cream sauce. We ate off each other’s plates. I’m a big fan of the lobster dish, which for those who haven’t had the pleasure…..is stir fried lobster with garlic, asparagus, shiitake mushrooms & snow peas. It’s topped with this divine “truffle-yuzu sauce” (which in all honesty…..I have no idea WHAT it is…..I just know it’s fabulous! He thought it was a fantastic meal. Being at a 2-top, we were elbow to elbow with other couples; & he was a little surprised at how chummy everyone is. Especially for such an elite cruise line. I explained that he just discovered who the true Crystal passengers are……not the stereotypical snobs that some people think WE are. If the uninitiated only knew……or maybe we don’t want them to know. We lingered a while longer over hot tea & dessert. I had to have the lychee sorbet; Michael had the chocolate soufflé cake. Just before we started eating dessert, a group of 4 were seated at a table to my left. And there sat Tim Conway. I keep wanting to just say a simple hello; but I figure the most polite thing I can do is just nod & smile; & basically leave him alone. He, his wife & the other couple they were traveling with are always smiling & seem to be having a great time. We strolled through the photo gallery; & I pointed out the assorted “characters” that have caught my attention this cruise (did I mention a “Lady Ga-Ga wannabe” before). Michael was a ship’s photographer back in the 80’s & 90’s; & he marveled at the streamlined way they operate now. The one kink in this beautiful day was a phone call Michael got about 6pm, telling him that the person that was supposed to come to work at midnight, called in sick. He works for the “T” (Boston commuter railroad). Since he’s the shift supervisor, it’s his job to find a replacement. He tried & tried; but ended up having to leave the ship at 11; & go straight into work (which is just a few miles away). He would have to work a double shift without sleep. As disappointed as I was, I felt really badly for him. About the only people leaving the ship at this hour were crewmembers. With an overnight in port (& it being Halloween), there was going to be lots of partying going on tonight. I put on the coat & boots & walked him out through the “terminal” (a term I find hard to use when describing this new Black Falcon Terminal….if they’ve done anything yet, I can’t see it). He had to park at least half a mile away; & I watched for his safety until he was out of sight. Not to worry, though, there was plenty of port security around. The air was pleasantly crisp; not windy; it felt quite good. This was the first time this cruise that I actually walked through the public areas late at night. Despite the fact that some passengers were obviously off ship for the evening, there were plenty of people milling around. I went back to the cabin; & proceeded to work at the computer. Finally about 1:30, I hit the wall. Probably was asleep before my head hit the pillow. And to think the only things I’ve seen of Boston so far is the back side of a dreary, grey brick building. What’s on the other side, could very well be Oz……..